Intensive Whitening Only From Belo | Mommy Joys | Marriage, Motherhood, Life. These days when it comes to skin whitening, Kojic is the top-of-mind ingredient for Pinoys. Proof that it has already dethroned papaya is the fact that too many Kojic brands have now started sprouting like mushrooms in supermarkets, groceries, and department stores, and they occupy much bigger display spaces than papaya brands such as Likas and Silka. Kojic Acid is an organic compound that effectively inhibits the production of tyrosinase and melanin giving skin a visibly lighter appearance. Tranexamic Acid, on the other hand, is a peptide proven to inhibit inflammation and melanin formation. It is ideal for stubborn dark spots that do not respond to other skin lightening ingredients. Yes, including those spots that even Kojic Acid alone cannot address. 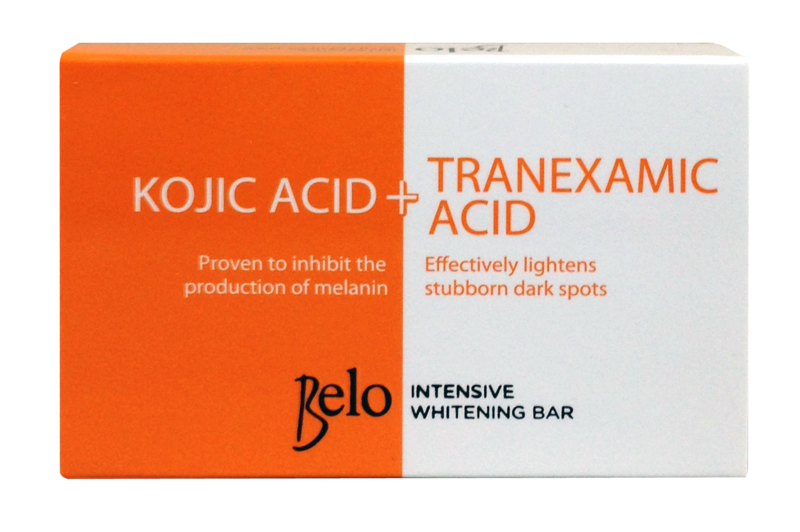 Now you see why Belo Kojic Bar (the product's nickname) is better than the rest. :) In fact, blind clinical tests show that it's 64% better than the leading Kojic soap brand! Imagine that? 64% is a lot! Well I guess you really have to try it to believe it. and the texture resembles that of a cream (unlike regular lotions which are thinner and watery). and removing ugly blemishes and spots.